Twisted wire offers custom wire groupings designed for easier handling and installation. Pairs, triples, quads (and even paired pairs) can be built to your specifications. 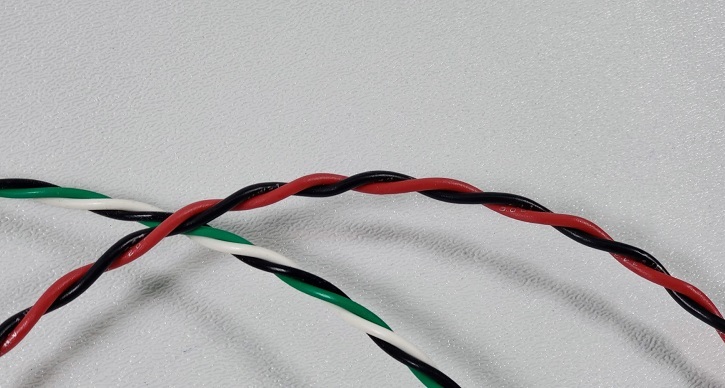 Just choose a wire insulation, your colors (striped wire can also be requested), AWG size, and number of twists per inch (TPI) and call or message us for a quick quote. Asapwire.com makes it easy to order twisted groups with a simple drop-down menu with options for base and stripe colors for many of the above variations. We offer a quick turn-around on your twisted wire requirements. Call, message, or order online today! Series# UL1007-26-XXTP1-0500. PVC Insulated UL1007 UL1569 CSA-TR64 26 AWG (7/34) hook up wire on a 500' spool; Twisted Pair Wire, 1 Twist Per Inch (TPI). Pick your colors! Series# UL1007-24-XXTP1-0500. PVC Insulated UL1007 UL1569 CSA-TR64 24 AWG (7/32) hook up wire on a 500' spool; Twisted Pair Wire, 1 Twist Per Inch (TPI). Pick your colors! Series# UL1007-22-XXTP1-0500. PVC Insulated UL1007 UL1569 CSA-TR64 22 AWG (7/30) hook up wire on a 500' spool; Twisted Pair Wire, 1 Twist Per Inch (TPI). Pick your colors! Series# UL1007-22-XSXSTP1-0500. PVC Insulated UL1007 UL1569 CSA-TR64 22 AWG (7/30) striped hook up wire on a 500' spool; Twisted Pair Wire, 1 Twist Per Inch (TPI). Pick your base colors and stripes! Series# UL1007-20-XXTP1-0500. PVC Insulated UL1007 UL1569 CSA-TR64 20 AWG (10/30) hook up wire on a 500' spool; Twisted Pair Wire, 1 Twist Per Inch (TPI). Pick your colors! Series# UL1061-24-XXTP1-0500. PVC Insulated UL1061 CSA SR-PVC 24 AWG (7/32) hook up wire on a 500' spool; Twisted Pair Wire, 1 Twist Per Inch (TPI). Just choose 2 of the 10 standard colors available! Series# UL1061-22-XXTP1-0500. PVC Insulated UL1061 CSA SR-PVC 22 AWG (7/30) hook up wire on a 500' spool; Twisted Pair Wire, 2 Twists Per Inch (TPI). Just choose 2 of the 10 standard colors available! Series# UL1007-18-XXTP1-0250. PVC Insulated UL1007 UL1569 CSA-TR64 18 AWG (16/30) hook up wire on a 250' spool; Twisted Pair Wire, 1 Twist Per Inch (TPI). Pick your colors! Series# UL1007-22-XXXTT1-0500. PVC Insulated UL1007 UL1569 CSA-TR64 22 AWG (7/30) hook up wire on a 500' spool; Twisted Triple Wire, 1 Twist Per Inch (TPI). Pick your colors! Series# UL1007-26-XXTP1-1000. PVC Insulated UL1007 UL1569 CSA-TR64 26 AWG (7/34) hook up wire on a 1000' spool; Twisted Pair Wire, 1 Twist Per Inch (TPI). Pick your colors! Series# UL1007-24-XXTP1-1000. PVC Insulated UL1007 UL1569 CSA-TR64 24 AWG (7/32) hook up wire on a 1000' spool; Twisted Pair Wire, 1 Twist Per Inch (TPI). Pick your colors! Series# UL1061-22-XXXTT1-0250. PVC Insulated UL1061 CSA SR-PVC 22 AWG (7/30) hook up wire on a 250' spool; Twisted Pair Wire, 2 Twists Per Inch (TPI). Just choose 3 of the 10 standard colors available! Series# UL1007-22-XXXTT1-0500. PVC Insulated UL1007 UL1569 CSA-TR64 22 AWG (7/30) hook up wire on a 500' spool; Twisted Triple Wire, 1 Twist Per Inch (TPI). Pick your colors! Series# UL1007-22-XXTP1-1000. PVC Insulated UL1007 UL1569 CSA-TR64 22 AWG (7/30) hook up wire on a 1000' spool; Twisted Pair Wire, 1 Twist Per Inch (TPI). Pick your colors! Series# UL1007-18-XXTP1-0500. PVC Insulated UL1007 UL1569 CSA-TR64 18 AWG (16/30) hook up wire on a 500' spool; Twisted Pair Wire, 1 Twist Per Inch (TPI). Pick your colors! Series# UL1007-22-XXTP2-1000. PVC Insulated UL1007 UL1569 CSA-TR64 22 AWG (7/30) hook up wire on a 1000' spool; Twisted Pair Wire, 2 Twists Per Inch (TPI). Pick your colors! Series# UL1061-24-XXTP1-1000. PVC Insulated UL1061 CSA SR-PVC 24 AWG (7/32) hook up wire on a 1000' spool; Twisted Pair Wire, 1 Twist Per Inch (TPI). Just choose 2 of the 10 standard colors available! Series# UL1061-24-XXTP2-1000. PVC Insulated UL1061 CSA SR-PVC 24 AWG (7/32) hook up wire on a 1000' spool; Twisted Pair Wire, 2 Twists Per Inch (TPI). Just choose 2 of the 10 standard colors available! Series# UL1061-18-XXTP1-0500. PVC Insulated UL1061 CSA SR-PVC 18 AWG (16/30) hook up wire on a 500' spool; Twisted Pair Wire, 1 Twist Per Inch (TPI). Just choose 2 of the 10 standard colors available! Series# UL1061-22-XXTP1-1000. PVC Insulated UL1061 CSA SR-PVC 22 AWG (7/30) hook up wire on a 1000' spool; Twisted Pair Wire, 2 Twists Per Inch (TPI). Just choose 2 of the 10 standard colors available! Series# UL1007-20-XXTP1-1000. PVC Insulated UL1007 UL1569 CSA-TR64 20 AWG (10/30) hook up wire on a 1000' spool; Twisted Pair Wire, 1 Twist Per Inch (TPI). Pick your colors! Series# UL1007-26-XXXTT1-1000. PVC Insulated UL1007 UL1569 CSA-TR64 26 AWG (7/34) hook up wire on a 1000' spool; Twisted Triple Wire, 1 Twist Per Inch (TPI). Pick your colors! Series# UL1007-14-XXTP1-0250. PVC Insulated UL1007 UL1569 CSA-TR64 14 AWG (41/30) hook up wire on a 250' spool; Twisted Pair Wire, 1 Twist Per Inch (TPI). Pick your colors! Series# UL1061-18-XXTP2-0500. PVC Insulated UL1061 CSA SR-PVC 18 AWG (16/30) hook up wire on a 500' spool; Twisted Pair Wire, 2 Twists Per Inch (TPI). Just choose 2 of the 10 standard colors available! Series# UL1061-24-XSXSTP2-1000. PVC Insulated UL1061 CSA SR-PVC 24 AWG (7/32) hook up wire on a 1000' spool; Twisted Pair Wire, each with Stripe, 2 Twists Per Inch (TPI). Just choose your base and stripe colors! Series# UL1007-22-XXXXTQ1-0500. PVC Insulated UL1007 UL1569 CSA-TR64 22 AWG (7/30) hook up wire on a 500' spool; Twisted Quad (4) Wire, 1 Twist Per Inch (TPI). Pick your colors! Series# UL1061-22-XXXXTQ1-0500. PVC Insulated UL1007 CSA-SR-PVC 22 AWG (7/30) hook up wire on a 500' spool; Twisted Quad (4) Wire, 1 Twist Per Inch (TPI). Pick your colors! Series# UL1007-22-XXXTT1-1000. PVC Insulated UL1007 UL1569 CSA-TR64 22 AWG (7/30) hook up wire on a 1000' spool; Twisted Triple Wire, 1 Twist Per Inch (TPI). Pick your colors! Series# UL1007-22-XXXTT1-0500. PVC Insulated UL1007 UL1569 CSA-TR64 22 AWG (7/30) hook up wire on a 500' spool; Twisted Triple Wire, 1 Twist Per Inch (TPI). Pick your colors! Series# UL1007-16-XXTP1-0500. PVC Insulated UL1007 UL1569 CSA-TR64 16 AWG (26/30) hook up wire on a 500' spool; Twisted Pair Wire, 1 Twist Per Inch (TPI). Pick your colors!